The dispute between United States Steel Corp. and its stakeholders over the future of U.S. Steel Canada Inc., has been sent to mediation by the Ontario Superior Court judge overseeing the Canadian unit’s restructuring. The issues in dispute between the United Steelworkers union, the Ontario government, salaried active and retired employees, and a former president of its predecessor company Stelco Inc. on one side and U.S. Steel on the other, will be examined by former Ontario Superior Court associate chief justice Douglas Cunningham in a three-day session scheduled to begin next week. “The mediation shall address the feasibility of a comprehensive agreement among the parties,” Justice Herman Wilton-Siegel said in an order. The mediation will also address a business plan for the Canadian unit, its potential sale, the shift of production of high value-added steel to the United States and U.S. Steel’s claim of more than $2-billion against the Canadian unit. U.S. Steel Canada has been operating under the Companies’ Creditors Arrangement Act since last September, but the announcement by its parent company that it plans to shift production of about 180,000 tons of high-quality steel annually out of its Canadian operations has sparked an imminent crisis in the restructuring. Shifting production would diminish the value of the Canadian assets in the eyes of potential buyers, steel industry sources said. U.S. Steel has started a sales process that has led to a bid by one competitor – Essar Steel Algoma Inc., which is based in Sault Ste. Marie, Ont., but has the backing of a deep-pocketed parent company in India. Potential buyers also need to wonder whether other steel-making contracts will be shifted out of Canada, leaving the Canadian operations to depend entirely on the spot steel market. Stakeholders have questioned whether U.S. Steel actually wants to sell U.S. Steel Canada – it has also bid for the assets – or use the restructuring process to avoid a pension liability of more than $800-million and an unknown environmental liability at the Hamilton site, where steel has been made for more than 100 years. “The worst-case scenario is that they want to mothball everything, pick up the pieces and leave and not have any liability,” said one source. U.S. Steel bought Stelco Inc. in 2007. Stelco had undergone a two-year CCAA process that led to its purchase by a group of investment funds. 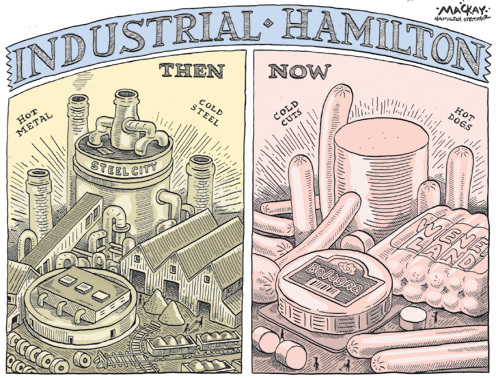 But U.S. Steel’s history in Canada has been one of confrontation. The company locked out unionized workers in Hamilton and Nanticoke, Ont., during three of four sets of contract negotiations and broke commitments made to the federal government when Ottawa approved the purchase of Stelco under the Investment Canada Act. U.S. Steel said it was forced to halt steel production in Canada because of the recession, but the broken promises led to the first prosecution of a company under the Investment Canada Act. If you want to put a tax on greenhouse gas emissions, there’s an easy way to do it. You implement a carbon tax, like British Columbia did, and add it to the price of gasoline and other fossil fuels. The higher the emissions, the more tax people pay. Anyone can understand how it works. Then there’s a second way, which is much more complicated and expensive. It requires a big bureaucracy to administer and is highly vulnerable to special interests. Lots can go wrong. In Europe, where they’ve been trying to get it right for a decade, it’s been an abject failure. This system is called cap and trade, and nobody but the experts can understand how it works. Kathleen Wynne’s Ontario has chosen the second way. The fact that cap-and-trade schemes are incredibly opaque is considered a feature, not a bug. The government can swear it’s not a tax, even though the taxpayers will wind up paying for it anyway as industry passes on the extra cost. Cap-and-trade is nothing more than a tax grab, critics say. But Premier Kathleen Wynne says to do nothing to fight global warming will cost the economy far more. “Cap-and-trade is a carbon tax by any other name,” Interim Progressive Conservative Leader Jim Wilson shot at the government to kick off question period. “When businesses pay more, consumers pay more … it’s a tax on everything,” Wilson said. Wynne said earlier at a news conference Monday that Ontarians are already paying for the effects of climate change in higher insurance premiums, among other things. The government estimates the 2013 ice storm cost $200 million in insurance payouts, while severe floods in the Greater Toronto Area resulted in nearly $1 billion in damages. A cap-and-trade system discourages carbon emissions through a complex system of credits. While details were scarce, Wynne did acknowledge that motorists can expect to pay 2.5 to three cents a litre more at the pumps under the proposed plan. But other than that, the program revealed little on exactly will pay and how consumers can expect to be impacted. Posted to Yahoo News Canada and iPolitics.